The deep garnet color of Carignano del Sulcis wines from Sardinia is extraordinarly beautiful. Dottore Marco Santarelli looks like a young Italian actor, more suited to making movies than growing grapes. 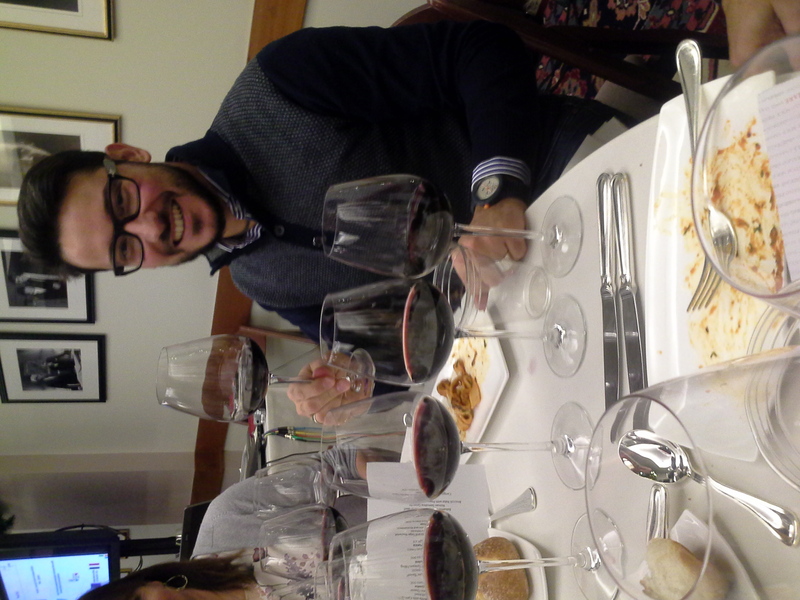 But the 32-year-old enologist is serious about his craft — winemaker for the Santadi winery in Sardinia’s Carignano del Sulcis region. 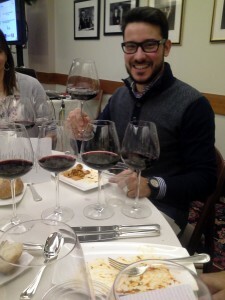 Santadi winemaker Marco Santarelli says crafting a good base wine is key to success. Santarelli does a lot of talking in the Sulcis, a beautiful, remote region in the southwest corner of the Mediterranean’s second largest island. Here, in the reddish-brown, beach-sand soils baked by a near flawless hot sun, the red Carignano grape thrives on ungrafted, low-to-the-ground “bush vines,” some of which are more than 120 years old. The five-member Consorizo Carignano del Sulcis, like characters in Pirandello’s famous play, is a winemakers’ alliance in search of U.S. distributors. I met Santarelli in December at a Boston tasting event highlighting the consortium, founded in 1977 to promote the region’s identity and culture through its wines. Sardinian winemaking is rooted in traditional, sustainable methods that defer to Mother Nature to guide a natural process. 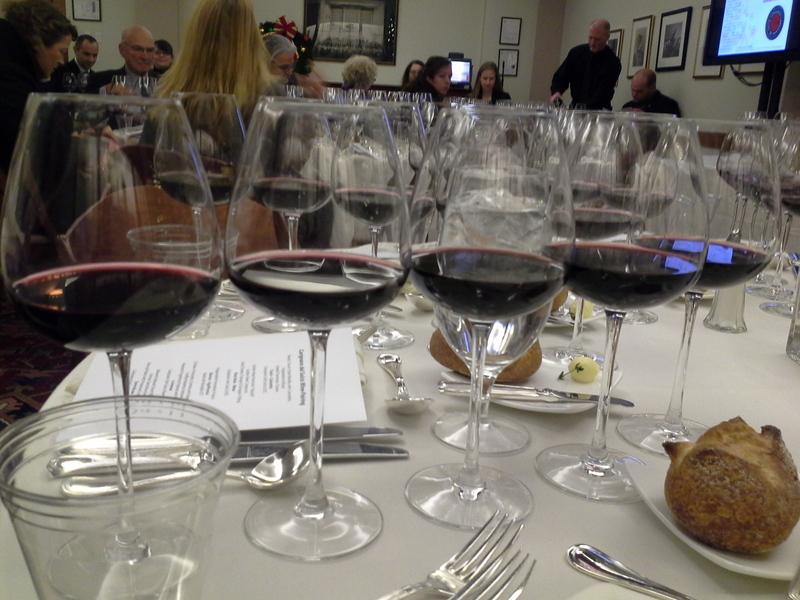 Unique, rich, pure-of-expression wines are the result. Carignano — Carignan in France — is a late-ripening grape that is susceptible to humidity, mildew and rot in most parts of the world. But the grape thrives to perfection in Sardinia’s hot, sunny climate. The only concern, as Santarelli tells it, is to pick the grape at the height of its ripeness. 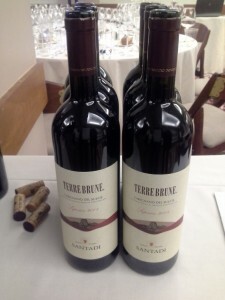 Terre Brune (brown earth) is a wonderful expression of the Carignano grape. Smooth, sultry and packed with complex flavors. “The sandy soils are poor for tannins so it is important that we get the best grape from the vineyard,” says the University of Piacenza graduate. 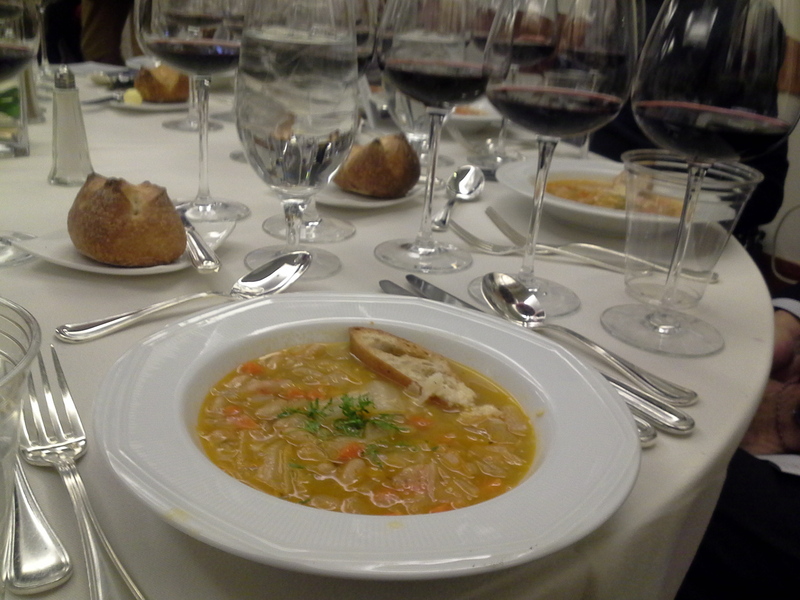 If the structure is there, the winemaker can build the composition, he adds. Santarelli cites the cellar’s success to the “great scientific capacity” of Dr. Giacomo Tachis, the respected Italian winemaker who saw the potential in the Carignano grape. Tachis is known for creating the famous Super Tuscan wine, Tenuta San Guido. Santarelli says he has benefitted from Tachis’ influence. Judging from Santadi’s 2008 Terre Brune Carignano Superiore, Santarelli is mastering the recipe for success. The wine is excellent, from its deep, ruby color to the blackberry fruit and spices spinning complex flavors from sip to swallow. We drank it with a divine dish of balsamic braised short rib of beef, Roman semolina gnocchi, and broccoli rabe with preserved lemon glaze. Mamma mia, how beautiful! The wine is difficult to find in Massachusetts although that is likely to change as soon as a distributor comes on board. 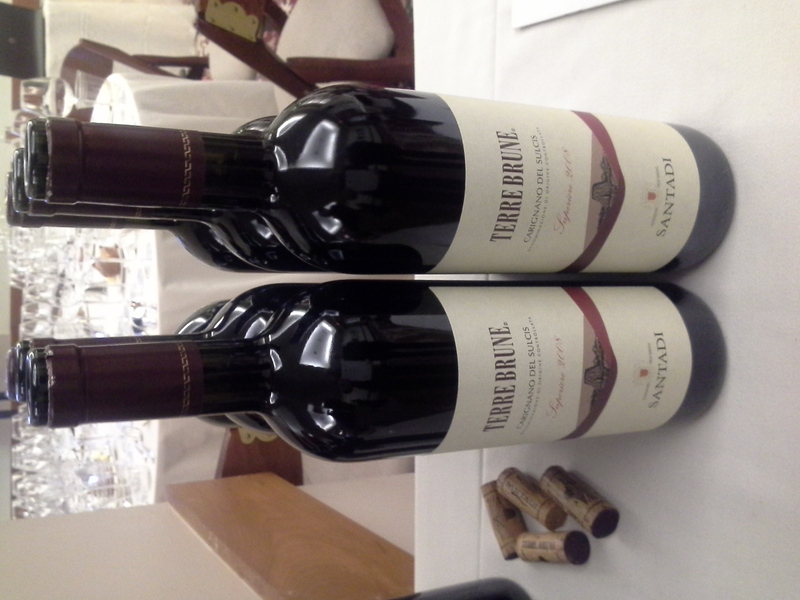 Santadi produced 70,000 bottles of the 2010 vintage, which Santarelli called a “classic growing season.” He said 300 six-packs of Terre Brune should be circulating in the area with more to come in the future. The suggested cost is $65 to $75 a bottle. Hearty Tuscan bean soup, with crusty bread, is a traditional way to enjoy Carignano del Sulcis wines. While Terre Brune was the star performer of the tasting — in my opinion — it wasn’t without strong competition. Here are other Carignano del Sulcis wines worth trying. • Sardus Pater Carignano del Sulcis Is Arenas Riserva, $45 — Sant’ Antioco is an island municipality of Sardinia dating back to the fifth millennium BC where the grapes for this warm, luxuriant wine are grown on 80-year-old vines. Very appealing in every way. • Cantina Mesa Buio Buio Isola dei Nuraghi IGT, $25 — Like the nuraghi stone towers built in the Bronze Age that still dot the landscape, this spicy Carignano is made to age with velvety grace. It’s the one to buy for taste, texture and value. • Cantina dal Calsetta Tupei, $16 — There’s no hint of cutting corners from this entry level Carignano. I was delighted to taste so much fresh berry fruit and energy in the glass. • AgriPunica Barrua Isola de Nuraghi IGT, $55 — A modern blend of Carignano, Cabernet Sauvignon and Merlot, it’s a multi-layered mix of dark cherry, black licorice and herbs. Elegant and satisfying. Kobrand is the U.S. distributor.